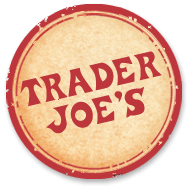 Trader Joe’s would rake it in at a Van Ness location. How do we know this? The response to our October/November retail survey, in this case, was overwhelming. Trader Joe’s easily wins the prize with 163 respondents (28% of the 582 who answered the question) wanting this establishment at Van Ness. Nothing else came close. To give you some perspective, Whole Foods comes in second with 67 mentions (12%). In total, 611 respondents filled out at least part of the survey. Sharon Bauer, who did the analysis for the Iona’s sidewalk gaps report, helped us sort through and make sense of all the responses. Let’s step back and look at who answered our survey. More than half of the survey takers, 371 (55%), live in or near Van Ness. A significant number, 161 respondents (28%), work nearby. A few both live and work here. 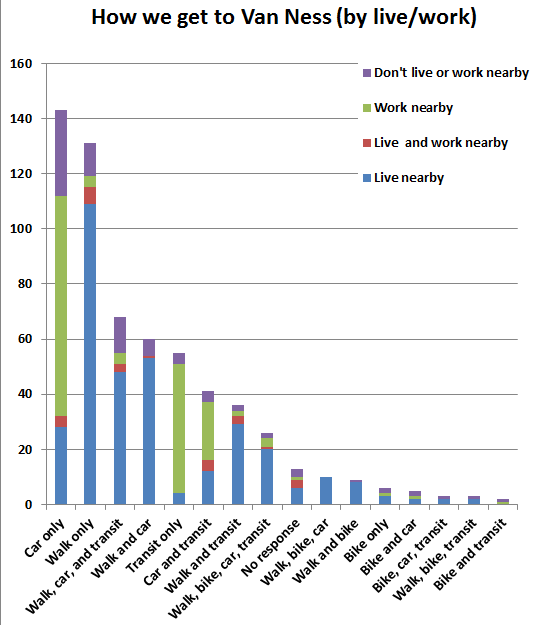 And we had 75 respondents who do not live or work nearby. Though this is a small number, it is significant that those who do not live or work here feel they a stake in what happens at Van Ness. People of all ages shared their ideas. 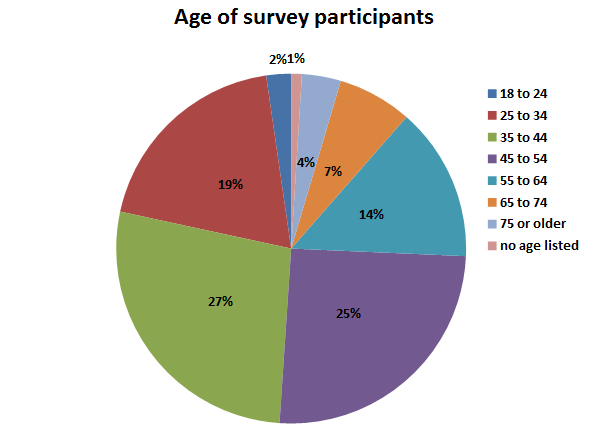 Here’s the age breakdown of survey takers. Respondents head to Van Ness because they live here, they work here, they shop here, they drop their kids off at school here, and they use the Metro station to go elsewhere. But how do they get here? I find the results of question #4 the most interesting part of the survey. The choices were walk, bike, car, mass transit. We broke down the responses of the 598 participants who completed this part of the survey in two ways. 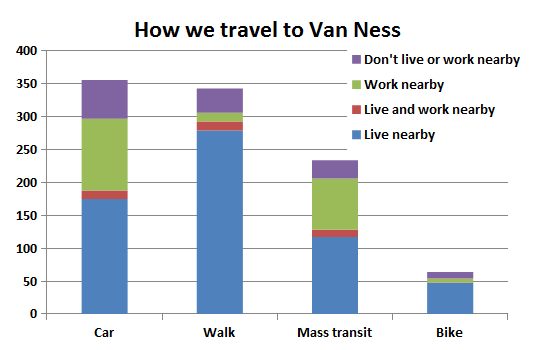 The first chart looks at total of each mode of travel by where folks live and work. What jumps out is that we have a higher level of walking for those who live close by than driving, and that the mode share between walking and driving are very close, with driving coming out slightly ahead. Also, the 10% of respondents who arrive on bikes is quite significant. Respondents could mark all travel options that would apply. For instance, someone could mark walking and mass transit. So we decided to break it down even more: By how many chose each mix of travel modes. 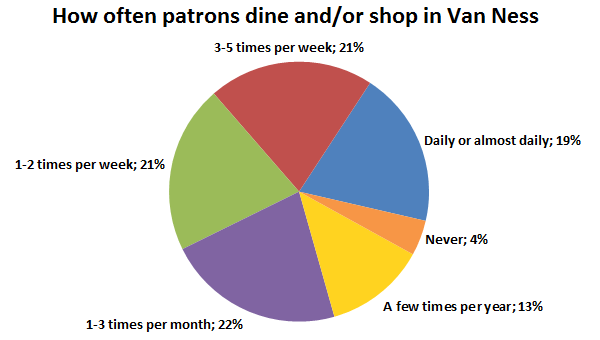 We move on to question #5 about how often patrons shop or dine at shops between Van Ness and Albemarle Street. These are the results, from 593 respondents. 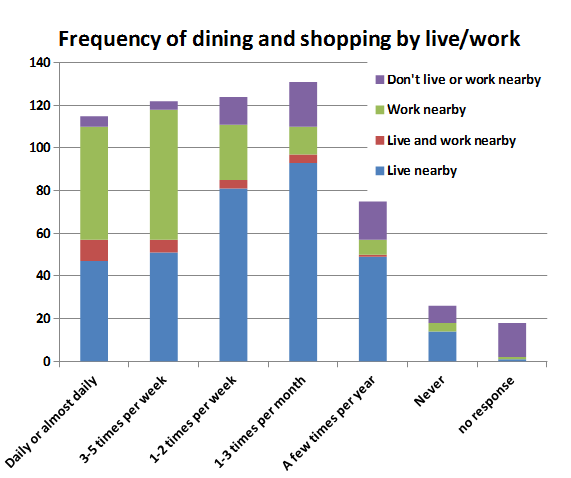 Another way to look at these numbers: How frequently we’re shopping and dining out, broken down by residents and workers. Now comes the juiciest part of our survey. What do the 582 who answered question #6 want beyond a Trader Joe’s? 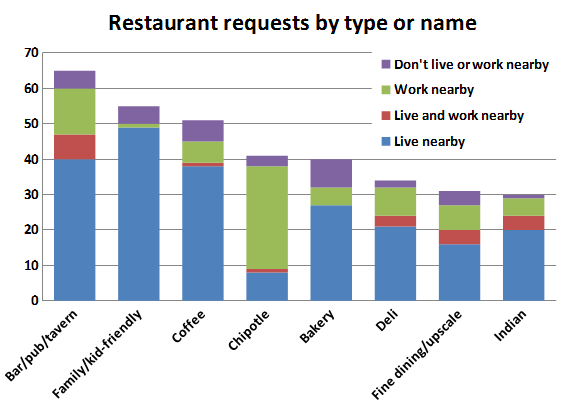 Restaurants/cafes got the highest of number of survey participants providing suggestions. We further categorized respondents into these categories: Casual dining, coffee/bakery, evening and ethnic. The “evening” category includes fine dining, bars and other nightlife venues that serve food – including the movie theaters requested by 10 respondents, and a handful of requests for a bowling alley or a Dave & Buster’s. Under “ethnic,” Indian, Thai and Chinese got the most responses. Both those who live and work here want casual dining. But beyond that the responses diverge. 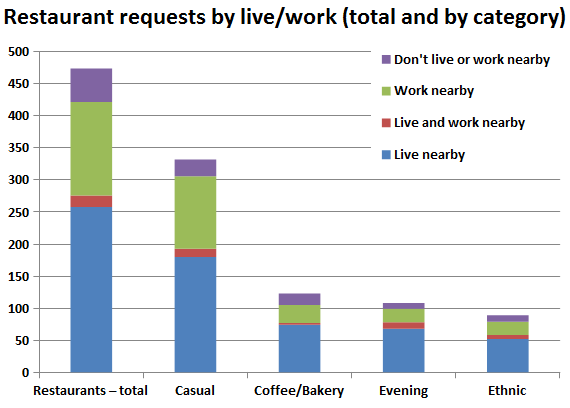 Highlighted in the chart below are specific requests that got more than 30 responses. As you can see, residents have an overwhelming desire for a neighborhood tavern. And the workers have a serious craving… for burritos. Residents and workers do find some common ground in their desire for a tavern and fine dining. But it will be a challenge for a restaurant in this area to appeal to both. Café Ole on Wisconsin Avenue is a good example of a restaurant that seems to be deftly handling the demands of both groups, with quick order and pick-up at the counter lunchtime, and wait service for dinner. It may be a good model for our area. Next, the retail responses, which were the most diffuse. Again, we needed to group the responses in ways we thought made sense. These are the categories we used: Unique/browsing, clothing, office supply, active lifestyle, home goods, hardware, and general/discount (such as Target and T.J.Maxx). The unique/browsing shops include stores similar to Wake Up Little Suzie in Cleveland Park and Periwinkle in Chevy Chase, bookstores, and gift shops, among others. We viewed these as stores that would encourage browsing, not a quick in-and-out. The businesses we included under the active lifestyle category include outdoor recreation and bike shops, yoga studios, and children’s gyms. The home goods category includes housewares and furniture – much like the Pier 1 in the former Van Ness Square. Turning the whole thing into a one-stop shop for kids with parents going to preschool makes a lot of sense. We got 49 requests for a family-friendly restaurant, 18 requests for a kids’ clothing store, 13 requests for an play gym, and a few want a gift shop that sells toys. One respondent asked for a child-friendly coffee shop with a play space (and a babysitter!) for the kids. Giant is better with its renovations but still THICK-HEADED about what locals want to buy. Produce is POOR and organic foods non-existent. Butchers are GOOD and underappreciated. A few respondents think we have a good mix of retail as it is, but add that the stores here already could do a better job of meeting the neighborhood’s needs. Union Market in NW! That would soar! The circles I run in love Union Market but getting over to NE requires advanced planning! Traffic is just too horrible to cross town to food shop! This would certainly scratch the itch for a cheese market, butcher, fresh fruit stand, or ethnic foods market. Other respondents asked for a flea market or year-round farmers market. Classroom, gallery and retail space for art like a mini Torpedo Factory or space for other creative endeavors like The Writing Center, practice rooms for local apartment dwelling musicians. Someone else requested a Makerspace. A hiking/outdoor store that leads tours through Rock Creek. New business incubator. Something like this, perhaps? What ANC 3F’s Van Ness Vision Committee learned last summer at the DC Office of Planning’s Vibrant Retail Streets workshop is that merchandise retail needs a significant daytime population to support them. In addition to residents, these businesses need the workers, UDC students, and the parents who come here because their kids attend the Franklin Montessori preschool. Van Ness is just on the edge of being able to support such retail. 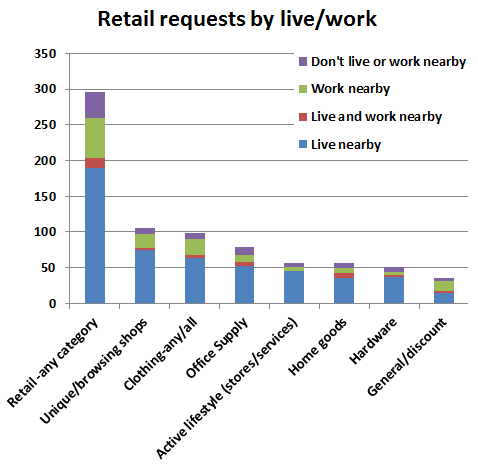 Residents appear to be much more interested in retail than those who work nearby. Several survey respondents wanted businesses that exist already in Tenleytown and Friendship Heights – Whole Foods, a hardware store, women’s clothing stores. So it is questionable whether we could attract and support similar retail. A better approach might be to complement what is nearby rather than replicate it. For a more detailed look at our results, click here to download a summary sheet (PDF). The Vision Committee will be using these results in a meet and greet scheduled for the property owners in February. These could also prove valuable to Saul Centers and UDC in their search for establishments to fill their retail spaces at UDC’s law school and student union, as well as Park Van Ness. 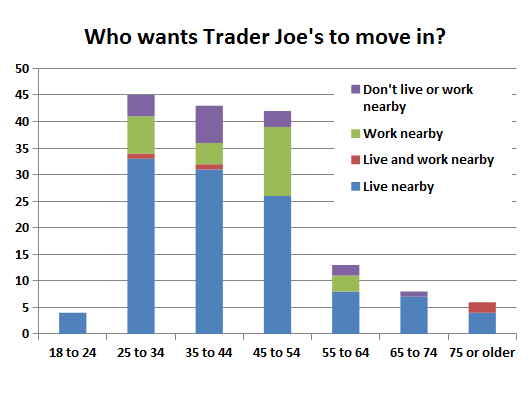 The clearest message from our survey is that the Trader Joe’s needs to come to Van Ness. Let’s get them here. Trader Joes in Bethesda and Rockville – Traffic and Pedestrian Nightmares. Is this what Forest Hills/Van Ness needs? Yes. Trader Joes would be a welcome addition. The only priority I would place above Trader Joes is a pub. A microbrewery/brewpub would be exceptional, but that’s probably a pipe dream. The neighborhood needs a good watering hole. We used to have a bar type establishment in the 70s/?80s (not sure when it went) which was called The Capricorn and was where Pier One was up until recently. It had half price pizza nights and we took the children for that but there was a decent bar as well. Trader Joe’s would be a welcome addition to this neighborhood. This area is a fantastic mix of hard working people, singles and families who would love to have a reasonable competitor to Whole Foods up the street. And maybe it would help improve the quality of the Giant down the street. A decent pub/restaurant with a fantastic neighborhood feel would be great too. So many evenings my husband and I have to leave the area to find one. I would rather stay here and help this area thrive! We need a yoga/meditation studio at Van Ness. Also, year round organic produce.